David Gillett has stepped down as captain of Market Deeping CC after 17 years in the hotseat. The left-handed legend will instead concentrate on accumulating big runs in the 2017 Lincs Premier Division campaign. Gillett will be 48 this year and has struggled with back problems for the last couple of seasons. He’s been first-team skipper at Outgang Road for most of the last 17 seasons. 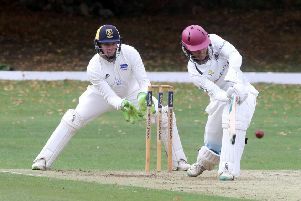 Wicket-keeper David Sargeant will skipper a first-team season that starts with a home match against Woodhall Spa on April 22. “It’s the right time to step aside,” Gillett announced. Gillett performed a minor miracle in guiding a side that lost key players Dan Bendon, Alex Wheatley and Chris Jones as the summer progressed, to a fourth-placed finish last season. Aussie off-spinner Zac Simmonds has agreed to return for a second season while batsman James Hook has been recruited from Spalding. Canny slow bowler Mehul Adatia is likely to miss most of the season because of an operation on a shoulder injury. Bourne face a tough start to their Lincs Premier Division season at champions Bracebridge Heath, while newly-promoted Spalding host Grimsby. Cambs League title candidates Ramsey Town have snapped up three Australians for the 2017 season. Opening batsman Ryan Smith and spin bowling all-rounders Isaac Love and Noah Craven-Biggs have signed on for the summer at Cricketfield Lane. Only one overseas player can play in any Cambs Division One match. The Rams open their top-flight season season with a mouth-watering derby at Wisbech Town on April 22. Nassington host Ketton that day, while newly-promoted March Town entertain Histon. Castor are back in the Cambs League in 2017 and open their Division Two campaign with a trip to Burwell seconds.